Home > Cannabis use in Ireland. The third bulletin of results from the 2006/7 all-Ireland general population drug prevalence survey1 (a follow-on from the first such survey in 2002/32) focuses on cannabis use in the adult population (15-64 years) and patterns of cannabis use. The final achieved sample was 4,967 in Ireland. This represented a response rate of 65%. This article highlights some of the survey findings and presents unpublished data from the National Drug Treatment Reporting System (NDTRS), the National Drug-Related Deaths Index (NDRDI) and Garda records. Cannabis use increased over the four years between the two surveys. The proportion of adults who reported using cannabis at some point in their lives (ever used) increased from 17% in 2002/3 to 22% in 2006/7. The proportion of young adults who reported using cannabis in their lifetime also increased, from 24% in 2002/3 to 29% in 2006/7. The proportion of adults who reported using cannabis in the last year (recent use) increased from 5% in 2002/3 to 6% in 2006/7. The proportion of young adults who reported using cannabis in the last year increased from 9% in 2002/3 to 10% in 2006/7. The proportion of adults who reported using cannabis in the last month (current use) remained stable at 2.6%. Those who had ever used: Half of all cannabis users had first used the drug before they were 18 years old. The lifetime prevalence rate was higher for men (27%) than for women (17%). Regular users: Over one-quarter (26%) of respondents who had ever taken cannabis reported using (or having used) it regularly. The lag time between first use and regular use was two years. Of those who were or had been regular users, two-thirds (66%) said that they had stopped taking cannabis, 10% said that they had tried to stop but failed and almost one-quarter (24%) had never tried to stop. Of those who had stopped, approximately one-third (32%) said they had done so because they no longer wanted to take the drug, 19% said they had health concerns and 17% said it was no longer part of their social life. Recent users: The majority (62%) of recent cannabis users considered it 'very easy' or 'fairly easy' to obtain the drug within a 24-hour period. Over half (57%) reported obtaining the cannabis they had last used at the house of friends, 12% obtained it in the street/park, 8% in a disco/bar/club and 5% ordered it by phone. The majority (44%) got the cannabis they had last used from a family member or friend, 28% had shared it among friends and 22% had bought it. Current users: The majority (60%) of current cannabis users reported using a form of cannabis resin. Almost two-in-five (38%) reported using a form of herbal cannabis. Approximately 24% used the drug daily in the month prior to the survey, a further 10% used it several times a week, 28% used it at least once a week and 37% used it less than once a week. Men were more frequent users than women. Almost all (99%) smoked it as a joint (93%), in a pipe (4%) or in a bong (3%): less than 1% ate the drug. Analysis from the NDTRS indicates that the number of treated cases reporting cannabis as a main problem drug decreased from 1,384 in 2003 to 958 in 2007 (Table 2), of whom 74% used one or more additional drugs. The number of cases reporting cannabis as an additional problem drug increased from 1,383 in 2001 to 1,630 in 2007 (Table 3). 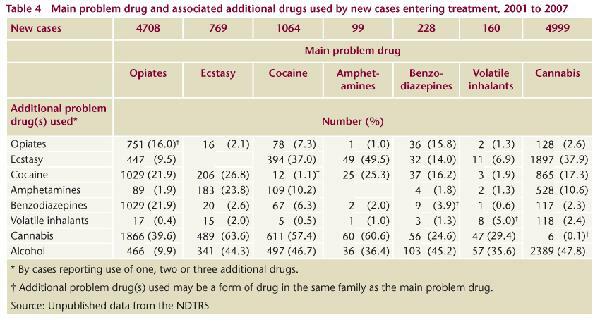 The drugs associated with cannabis use were alcohol, ecstasy, amphetamines and cocaine (Table 4). These data indicate that only a small proportion of cannabis users are seen at treatment services, and that the majority of those use more than one drug. Of the 958 cases treated in 2007 who reported cannabis as their main problem drug, 99% smoked it, and 1% ate it. Use by these cases in the month prior to treatment was reported as follows: 49% used it daily, 22% used it between two and six days per week, 8% used it once per week or less and 19% had not used it. As expected, the frequency of cannabis use among treated cases was considerably higher than that among the general survey population. Of these 958 cases, half had commenced cannabis use before they were 14 years old, and 86% were men. Of the total number, 109 (11%) lived in Dublin and 849 (89%) lived elsewhere in Ireland. The numbers reflect the greater availability of treatment for cannabis, cocaine and other non-opiate drugs in Dublin, rather than use among the general population. Cannabis accounts for the majority of all drugs seized in Ireland. Of the 8,417 reported drug seizures in 2006, 4,243 (50.4%) were of cannabis.4 The cannabis seizure data is in line with the use of cannabis among the general population prevalence data indicating that it is the most common illegal drug used in Ireland. 1. 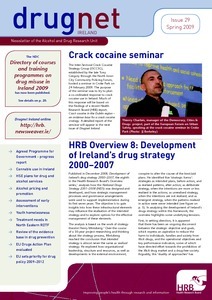 National Advisory Committee on Drugs and Drug and Alcohol Information and Research Unit (2008) Drug use in Ireland and Northern Ireland. 2006/2007 drug prevalence survey: cannabis results. Bulletin 3. Dublin: National Advisory Committee on Drugs. 2. National Advisory Committee on Drugs and Drug and Alcohol Information and Research Unit (2005) Drug use in Ireland and Northern Ireland. 2002/2003 drug prevalence survey: cannabis results. Bulletin 3. Dublin: National Advisory Committee on Drugs. 3. Lyons S, Lynn E, Walsh S and Long J (2008) Trends in drug-related deaths and deaths among drug users in Ireland, 1998 to 2005. HRB Trends Series 4. Dublin: Health Research Board. 4. Alcohol and Drug Research Unit (2008) 2008 National Report (2007 data) to the EMCDDA by the Reitox National Focal Point. Ireland: new developments, trends and in-depth information on selected issues. Dublin: Health Research Board.